Two YouTube pranksters who broke into the Celebrity Big Brother set have been sentenced to 120 hours community work. 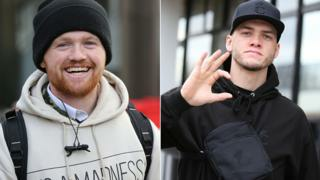 Ally Law, 21, and Ryan Taylor, 25, got into the television studio in Elstree, Hertfordshire, in January 2018. Law, of Hepworth Close, Southampton, and Taylor, of Lichfield Road, Bloxwich, were previously found guilty of two charges of aggravated trespass. They were also told to each pay costs and compensation of £1,235 at St Albans Magistrates' Court. A trial in December heard the pair wore high-vis jackets to pass themselves off as security guards to get on to the set. Law dropped his trousers to jump into the famous housemates' hot tub as Taylor filmed him. In the end a guard had to jump in fully clothed to fish laughing Law out of the water while metal security shutters came down over the windows of the Big Brother house, the court heard. The stunt was filmed on a GoPro camera and the footage posted online. The antics of the pair last January left housemate celebrities including Wayne Sleep, Amanda Barrie, Ashley James, Dapper Laughs, Jess Impiazzi, Jonny Mitchell, Ginuwine and John Barnes, shocked and alarmed. Magistrate Stuart Jack told the pair as he sentenced them: "We have found you intended to obstruct and disrupt the Big Brother production but didn't intend to intimidate." Law was also banned from entering any film or TV studio, areas of bridges or buildings not open to the public, any commercial property outside business hours and any attraction owned by Merlin Entertainments, for the next five years. The pair have gained notoriety in the past by filming themselves carrying out mischief-making stunts and antics. Law has nearly 2.6 million subscribers on YouTube, while Taylor has more than 1.6 million. Stunts have included riding a BMX bike off a diving board at the Olympic pool and climbing up cranes.